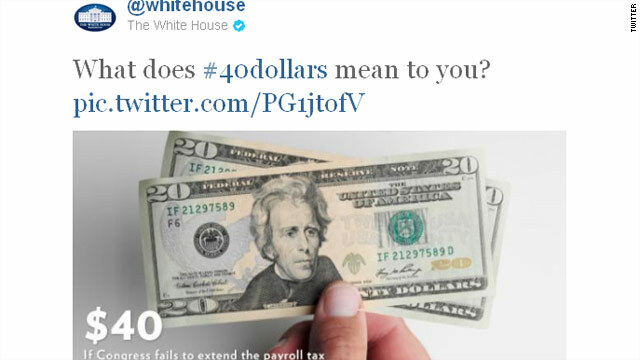 White House social media gurus took to twitter Tuesday afternoon after it was clear Congress would adjourn without extending the payroll tax holiday. Their question to tweeps? What does $40 - the average amount Americans will lose from each paycheck if the holiday is not extended - mean to them? "It would be easier to make my student loan payments," tweeted Matthew Nocella. David Paul Hluchy posted on Facebook that $40 means "40 Hot Wheels mainline cars." « Previous entryWhat's behind Obama's rising poll numbers? people are finally seeing what the republican party is really all about. Taking pledges from people with their own agendas. Working for the rich and big business. Favoring the health insurance companies and even while decrying wall street investing for their own personal gain. The only one out their working for the average citizen is the democratic party lead by the president. He has spent hours trying to bring both sides to the table . A+ on his foreign policy . The repos would have us in another war if left unchecked. A little humor for you! We are doing well with the EBTs and the California Weave! This will make sure they eat their hats! The Republicans want me to keep $480 next year. Obama wants me to keep $80. One more reason why Obama is simply out of touch with rational Americans. Just another wool over the eyes...The House has remained committed to staying to figure out and finalize the differences for a year long solution. The Senate said "well we've done what we're going to do, either the House pass it or let it fall." And you're calling Republicans the party of no-compromise? Hmm. As for this particular propoganda piece, the AVERAGE difference is $40...based on bringing the SS tax back up 2%, based on 26 paychecks a year, that would be on someone making $52k/year. Those making less would see a less drastic "loss" and those who make more can afford it, right? Let's not forget, too that all this is doing is further damaging the coffers of an already sinking SS ship. Wasn't it just a few years ago we were discussing RAISING SS taxes to keep it solvent? But that's ok, we can just keep soaking the rich to make up the difference in the future–oh, no, actually it'll by your kids and grand kids (great-grandkids, jean) who are footing this bill. Of course, non of this would be an issue if we hadn't created a society of Gov't (read "taxpayer") dependents. Oh the joys of being ignorant of the bigger picture and long term effects on others, maybe I will become a gov't dependent after all. And I am not blind or ignorant to the fact that the Republicans have failed in seeing the big picture effects either. When you start challenging folks, you'll get the silent treatment (or you will suddenly become a bigot or racist)! In fact, you'll get everything but an answer! Tread lightly my friend! Move over propaganda train is coming through... Chooga... Chooga... Chew... Chew! It's not even worth the paper it's written on. Especially concerning, "the dragon society."